More books than you can deal with, frankly. It is precisely the improbable contradictions Evan Morgan embodied in his life, the unlikely meeting of the most disparate worlds, which makes this writer/occultist/aristocrat/papal bigwig so interesting. He was an occultist, yet chamberlain to two popes; gay, yet husband to two women. He was a friend to Augustus John, john to Denham Fouts, bogey-man to the Establishment. He mixed with royalty and rabble, and there was a Jekyll-and-Hyde polarity within his own personality. Fitzrovia was a stone’s throw from Bloomsbury but a world away in temperament. According to the Times Literary Supplement, Fitzrovia was “a world of outsiders, down-and-outs, drunks, sensualists, homosexuals and eccentrics”. 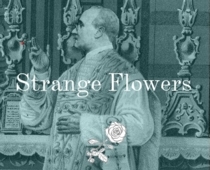 In short, the spiritual home of Strange Flowers. Casati claimed to be her own work of art, but it was a work with its own set of influences. Her crepuscular glamour, for instance, owed much to Elisabeth of Austria and her cousin Ludwig II and she vied with Montesquiou as the Countess de Castiglione’s posthumous BFF. Firbank, it seems, was born blushing; his associates never fail to mention his social awkwardness, particularly the incessant fluttering of hands and the hysterical laughter which would periodically erupt, leaving him incapable of completing an anecdote.